A man was arrested after police say he fired shots at two males and then barricaded himself inside a Philadelphia home. 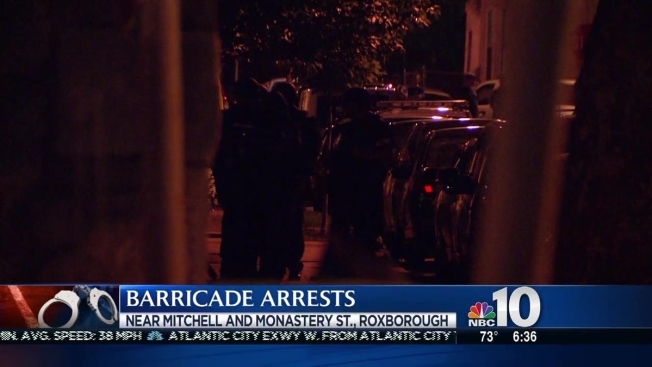 Two males were walking on Mitchell Street and Monastery Avenue in Roxborough around 11 p.m. Monday when a 39-year-old male came out of a home and began shooting at them with a rifle. One of the pedestrians pulled out his legally registered gun and returned fire at the suspect. The suspect then ran back inside the home and barricaded himself inside. Police were called to the scene and they were able to place the suspect under arrest after a short standoff. In addition to finding a rifle inside the home, police say they also found three children under the age of five inside. They were not harmed. Police also took three adults, who were found hiding in the basement, in custody. The suspect and the individuals he fired at are being interviewed by detectives. No one was struck by any of the bullets. It was not immediately known why the suspect fired at the victims in the first place.